Web browsers are still missing a fundamental feature: autosaving textarea input. It should function like any other editor that we’re used to. Microsoft Word has autosaving and so does this WordPress content area when drafting a post. Even the single line input fields remember what you’ve previously submitted them with. Why are browsers still missing this feature as we use them more and more as actual apps? Gmail? Google Docs? I should be able to right click (Windows) in the textarea and select which revision to update it to or delete all entries if I wish. I grabbed the FC7 version for CentOS 5.5, extracted, ran the install script with an ETS listening on port 80 and origin host at localhost and port 81. Turn on ESI Debugging too, it’s rather informative being able to view the source with ESI tags and the actions of the server on those tags. To see the debug info view the page source of a request since they’re hidden. Edit the standard Apache install at /etc/httpd/conf/httpd.conf and change it to listen on port 81. Akamai’s config will need a couple headers in order for Symfony to respond with ESI tags in the response. Now Symfony 2 will see that an ESI Surrogate is making a request and it will respond with the ESI tag instead of filling it in. Develop your app using port 81 and test your ESI through port 80. View the page source to see the debugging info if debugging is enabled. In my previous article about the lack of exceptions in PHP libraries, I came across an inconsistency with Simple Cloud‘s API (now known as the Zend_Cloud component) between file storage adapters. The issue is that Windows Azure and Nirvanix storage adapters will always throw an exception on an unsuccessful attempt (checked against the API response) whereas Amazon S3 adapter will return true/false (checked against API response) or an exception (some other underlying client error) therefore breaking portability. You could add an explicit check for false but that isn’t obvious. There’s also no use of the @throws tag in the docblock making this even less obvious. I’ve only checked this against the file storage part of Simple Cloud but I seem to remember the same no-exception issue being in the Amazon SQS API as well. Another issue is that the docblock for Zend\Cloud\StorageService\Adapter\S3.php storeItem() has “@return void” which isn’t the case (most of the other methods appear to be this way as well). Update 2010-12-25: AWS techs informed me that Route 53 is designed with a balance between latency and availability hence why not all name servers go to the nearest data center like I was expecting. Another AWS tech informed me that DNS resolvers utilize various performance techniques such as issuing parallel queries and remembering which nameserver responded fastest. Although I do not know of any resolvers that actually implement these techniques, and the AWS tech has yet to respond, I think this is a solid decision for Route 53 and the tests following are an example of that. I ran a few tests from some of the datacenters I have servers in (should’ve ran some tests from the East coast..). They don’t impress me that much and raise a concern for when Route 53 adds location-aware results because I sure don’t want to send Northern California users all the way to the Europe (Ireland) region. Hopefully they’re working out these kinks although this is a routing level issue and possibly out of their control. Only two using LA datacenter..
Only one using the DFW datacenter? Two of them going to Germany from Northern California??? Sample dig queries return similar response times. Set them to “Other” > “Generic button” … Who would’ve thought? The silliest part of it all is I went to Logitech’s site first instead of Google.. I was trying out Neo4j due to my curiosity of the graph specialization. Although Neo4j is not designed to run stand-alone like a database server there is a sub-project that adds a REST API to allow non-Java applications to make use of Neo4j. Neo4j is pretty simple, you basically have nodes, relationships, and properties on both. That’s about it. Please be aware that I have not thoroughly tested this. Just so you have a visual idea of what it looks like inside Neo4j I wrote a simple graph via Graphviz. 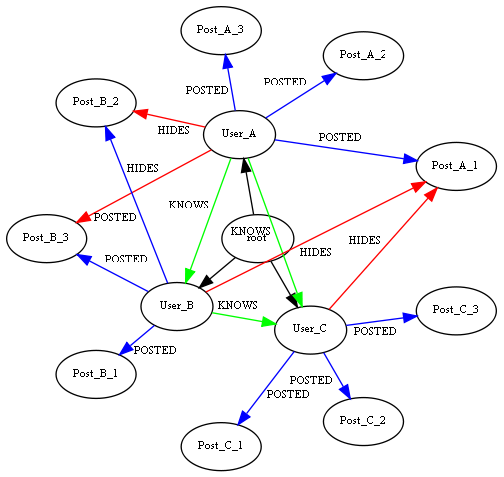 Green = KNOWS, Blue = POSTED, and Red = HIDES. Here’s some snippets of code (that should really be cleaned up to more reflect the image but I know you will understand) to create some nodes and relationships using the Neo4J-REST-PHP-API-client library. This is minimal to maintain clarity so feel free to add more users, messages, and relationships. This traversal can be paraphrased as “find UserA’s (identified by an ID of 1) friend’s message postings that have not been hidden by UserA”. We’re only interested in messages so skip (by returning false) any nodes without a “message” property. We then get all the relationships on that node, grab an iterator to loop over the relationships, and skip it if that node has been posted or hidden by UserA.